This guide will show you how to and why you should keep Ubuntu up to date. If you have just installed Ubuntu for the first time you might be annoyed when a little window pops up asking you to install hundreds of megabytes worth of important updates. The actual ISO images aren't updated on the website constantly and therefore when you download Ubuntu you are downloading a snapshot from a point in time. For instance, imagine you downloaded and installed the latest version of Ubuntu (15.10) at the end of November. That version of Ubuntu will have been available for a few weeks. Undoubtedly due to the size of Ubuntu there will have been a number of important bug fixes and security updates during that time. Rather than update the Ubuntu image constantly it is much easier to include a software package which makes it possible for you to download and install any updates. Keeping your system up to date is essential. Failing to install security updates is akin to locking all of the doors on your house whilst leaving all the downstairs windows open. The updates provided for Ubuntu are much less intrusive than those supplied for Windows. In fact, Windows updates are infuriating. How often have you had to hurriedly boot your computer to print out tickets or get directions or do something else that needs to be done quickly only to find the words "Update 1 of 246" appear? The funny thing about that scenario is that update 1 to 245 seems to take a few minutes and the last one takes ages. The first piece of software to check out is "Software & Updates". You can open this package by pressing the super key (Windows key) on your keyboard to bring up the Ubuntu Dash and search for "Software". An icon will appear for "Software & Updates". Click on this icon. You definitely want to keep the important security updates checked and you want to keep recommended updates checked because this provides important bug fixes. The pre-released updates option provide fixes targeting specific bugs and they are only proposed solutions. They may or may not work and may not be the final solution. The recommendation is to leave this unchecked. Unsupported updates are used to provide updates to other software packages not provided by Canonical. You can keep this one checked. Most updates however are provided via PPAs. 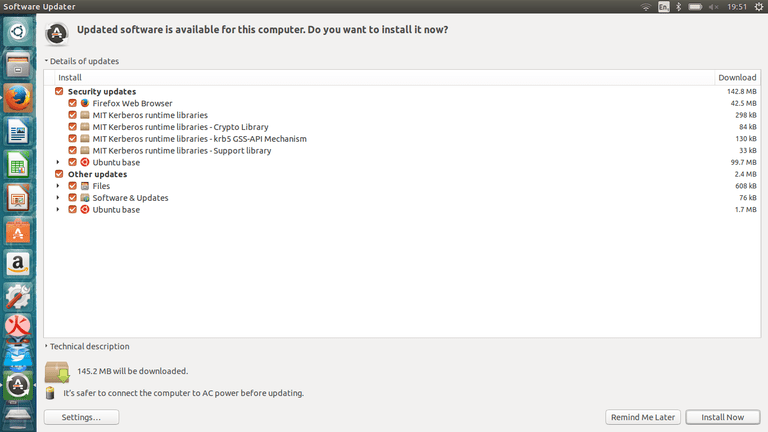 The checkboxes tell Ubuntu the types of update you are looking to be informed about. There are however dropdown boxes within the Updates tab which let you decide how often to check and when to notify you about updates. By default the security updates are set to be checked daily and you are notified about them immediately. Other updates are set to be displayed weekly. Personally for security updates I think it is a good idea to set the second dropdown to download and install automatically). The next application you need to know about for keeping your system up to date is the "Software Updater". If you have your update settings set to display immediately when there are updates this will load automatically whenever a new update requires installation. You can however start the software updater by pressing the super key (Windows key) on your keyboard and searching for "software". When the "Software Updater" icon appears click on it. By default the "Software Updater" shows a small window telling you how much data will be updated (i.e. 145 MB will be downloaded". If you haven't the time to install the updates right away then click the "Remind Me Later" button. Unlike Windows, Ubuntu will never force the updates on you and you will never have to wait for hundreds of updates to install whilst you are trying to do something important and even whilst you are installing updates you can continue using the system. The "Install Now" option will obviously download and install the updates to your system. The "Settings" button takes you to the "Updates" tab on the "Software & Updates" application. Before you install the updates you might want to see exactly what is going to be installed. There is a link on the screen that you can click called "Details of updates". Clicking on the link shows a list of all the packages that will be updated along with the size of them. You can read a technical description of each package by clicking on the line item and clicking the technical description link on the screen. The description usually shows the currently installed version, the available version and a brief description of potential changes. You can choose to ignore individual updates by unchecking the boxes next to them but this is not a recommended course of action. I would definitely use this screen for information purposes only. The only button you really need to worry about is "Install Now". This article is item 4 in the list of "33 things to do after installing Ubuntu". Other articles will be added shortly but in the meantime check out the full list and follow the links made available within.